The power of the IBM System z, combined with the flexibility of Linux on System z, provides the ideal platform on which to implement SAP application servers. System z provides the benefits of continuous availability, high performance, scalability, and ease of management; these qualities support and complement mission-critical SAP business applications. 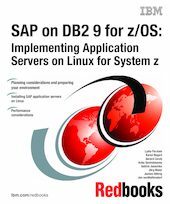 This IBM Redbooks publication focuses on the implementation of SAP application servers on Linux on System z to leverage the synergy of this combination of products. It provides detailed information to guide you through the planning process, including resource sharing considerations, hardware and software requirements, support and maintenance. This book takes you through the steps to prepare the system environment, describing system and network configurations, and demonstrates the procedures for installing and customizing your system. It describes in detail how to install SAP application servers in z/VM Linux images, including the installation of SAP and Java and hipersockets. Finally, it provides guidance for performance tuning and introduces some useful monitoring tools.